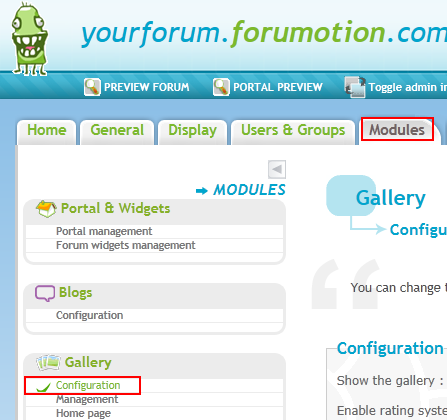 You will notice that as an administrator, there has now been a link to the Gallery added in the navigation links at the top of the page. In this gallery, only the administrators can add or classify the public categories and albums. 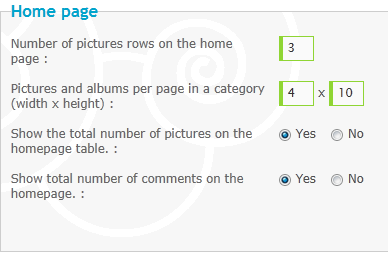 First, you must create categories, which serve to group albums according to the themes of your choice. Note: a category can also contain photos. Then, give it a title (e.g. 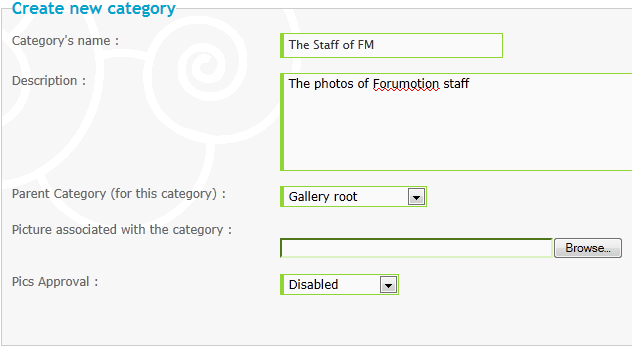 : The Staff of FM), a description and a photo associated with it. Then, choose the parent category. Don't touch it if you want it to be attached to the root. Once that's done, you need to upload your photos, but there may be many files in a single category so you can create albums or other categories to sort all your photos. In our example, we could for example create some albums (e.g. : an album 'Support Moderators' ; an album 'Graphic Designers', etc.) in the category 'The Staff of FM'. Note : an album may contain photos. Like the category, you fill out the fields and set the permissions for the album, then validate the settings. 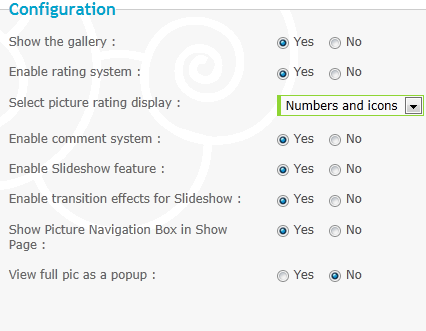 Note : permissions are not available in the free version of the gallery. - Number of pictures rows on the home page : for example, if you put 4 then there will be 12 (4 x 3) categories displayed on the home page, if any. To access the other categories, you use paging.- Pictures and albums per page in a category (width x height) : for example, 4 x 2 would result in 4 lines of 2 photos / albums. You use the paging to navigate.- Show the total number of pictures on the homepage table : if activated, the total number of photos in each category is shown.- Show total number of comments on the homepage : if activated, the total number of comments in each category is shown. Each member can have a personal album. - Personal album can be moderated by owner : if enabled, then members are able to moderate their own albums.- Personal albums pics must be approved by an administrator or by a moderator : if activated, the photos of the personal albums must be approved by an administrator or moderator before appearing. Note : in the free version, the permissions don't work, the admins have all the rights. This page lists the information on disc space.